On August 29, 1758, colonists established the first Indian reservation in what would be the United States, in Shamong Township, New Jersey. 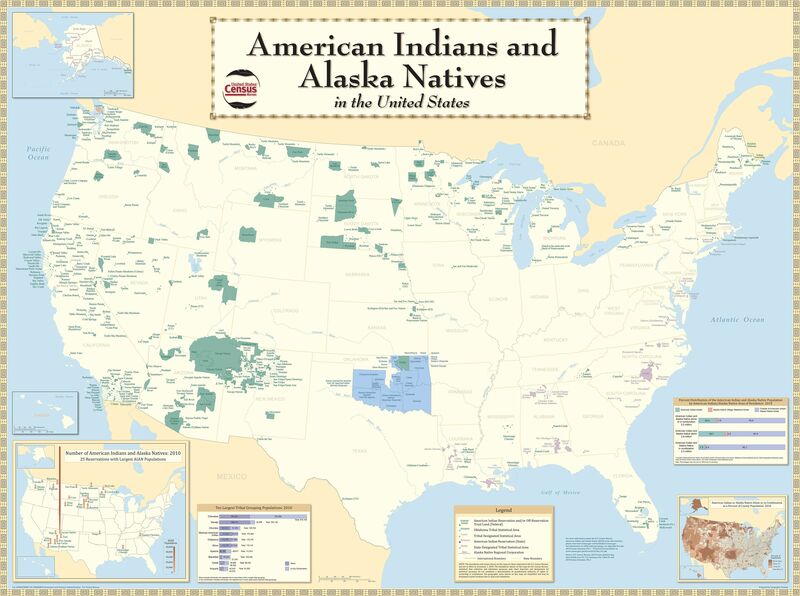 This spectacular map displays Native American reservations, trust lands, federally designated tribal statistical areas, and Alaska Native Regional Corporations. The map is based on data from the 2010 U.S. Census. On August 29, 1758, European colonists established the first Indian reservation in what would be the United States, in Shamong Township, New Jersey. The 3,000-acre reservation was created for the local Lenape (sometimes called Delaware) community, and called the Brotherton reservation. New Jersey sold the Brotherton reservation in 1801, giving most of the money to its former residents. Some Lenape stayed in New Jersey. Some joined the Oneida, a related Iroquois community in New York. Others moved to what are now Wisconsin and Ontario, Canada. Still others joined Cherokee and Osage people in the “Indian Territory” of what is now Oklahoma. Today, more than a million Native Americans live on 310 reservations across the United States. Reservations are somewhat autonomous, with their own laws and police forces. The largest reservation is the Navajo Nation, which stretches across 17.5 million acres in northeastern Arizona, New Mexico, and southern Utah. people and culture native to the southeastern United States. member of a colony, usually a founding member. people and cultures united as a confederacy in the northeastern United States and southeastern Canada. Also called the Six Nations, for members of the confederacy: Mohawk, Oneida, Onondaga, Cayuga, Seneca, and Tuscarora. people and culture native to the Delaware River watershed along the mid-Atlantic coast of what is now the United States. Also called the Lenni Lenape and Delaware. people and culture native to the southwestern United States. people and culture native to the Great Lakes region of what is now upstate New York. people and culture native to what are today the U.S. states of Kansas, Missouri, Arkansas, and Oklahoma. land in the U.S. reserved for the political, cultural, and physical use of Native American tribes and nations. person who lives in a specific place.